Carmen Cefai, Laner Cassar, John Cachia, Nadine Delicata, Pamela Portelli and Maria Grech Debono. 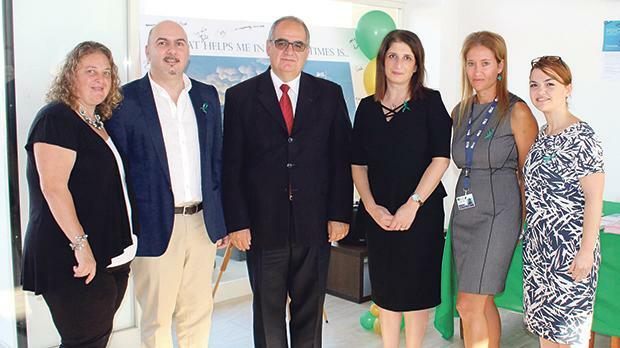 The new Psychology Department of the VGH Gozo General Hospital organised two open days in the hospital’s foyer. People were able to meet up with staff members from this department and get to know more. Information about individual and group psychology services provided by the department was given to those who attended, as well as information on upcoming psycho-educational courses. Visitors could also engage in the interactive art installation entitled ‘Bridge over trouble waters’, which arose curiosity and interest. Three Klown doctors from Mater Dei hospital joined the psychology team on the first day and helped animate the event and lift the spirits of service users. Mental health commissioner John Cachia, who visited the stand, was greeted by the hospital’s CeO Nadine Delicata. Two public talks, entitled Is-saħħa mentali – Għarfien u kura psikologika (Mental Health – Knowledge and Psychological Cure) and Ir-relazzjoni bejn il-mard fiżiku u s-saħħa mentali (The Relationship between Physical Illness and Mental Health), marked International Mental Health Day, which is celebrated worldwide.